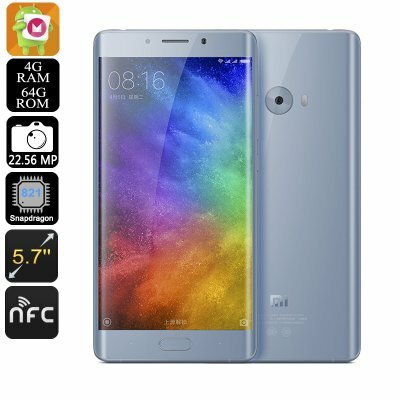 Successfully Added Preorder Xiaomi Mi Note 2 Smartphone 64GB - Android 6.0, 4GB RAM, Snapdragon 821 CPU, 5.7 Inch Display, 22.56MP Cam, 4G (Silver) to your Shopping Cart. This Product is a Pre-Order Product that is expected to be shipped on the 20th of December. Do not order with other products. This is a Pre-Order product and as such the weight, dimensions and specifications of this product could be subject to change. We will update the listing when the product is received in stock. With its massive 5.7 Inch Full HD display that curves around the edges of the device, the Xiaomi Mi Note 2 truly is a feast too the eye. Featuring an extremely thin and stylish body this Chinese smartphone truly holds the design of a high-end Android phone. At the rear of this stunning smartphone you will find an ultra-fast fingerprint scanner that helps you secure all your personal files. Additionally, a magnificent 22.56 rear camera can be found that allows you to snap breathtaking images and shoot incredible 4K video of all your upcoming adventures and friend nights out. Behind its stunning 1080p display this flagship Android phone holds some serious hardware. Packing an ultra-fast Snapdragon 821 CPU that has been clocked at 2.35GHz, this Chinese smartphone is sure to handle effortlessly whatever you throw at it. Considered as one of the most cutting-edge mobile processors ever created, this Quad-Core CPU was designed to deliver superior graphics, connectivity, battery efficiency, and power to guarantee an incredibly smooth user experience. Along with its 4GB of RAM this Xiaomi phone is the perfect multi-tasking device that offers a great platform for browsing the web, watching the latest movies, and playing the most demanding mobile games. With its MIUI 8 operating system the Xiaomi Mi Note 2 offers all the same features as that of the latest Android 6.0 smartphones along with a whole bunch of its own optimization features that let you take the most out of your smartphone experience. With 64GB of storage, you can be assured that this Android smartphone offers plenty of space for you to save all your files and media, letting you fully enjoy the magnificent experience this smartphone has to offer. NFC technology allows you to make secure mobile payments, making your shopping trips a whole lot easier as from now on you can simply use your phone as your digital wallet. Additionally, this Chinese smartphone features an extremely accurate GPS navigation system, ensuring that you will never get lost again. With its massive 4050mAh battery and Quick Charge 3.0 technology, it is guaranteed you’ll never run out of juice – allowing you to enjoy all the phone’s features to the absolute most. Supporting 4G connectivity and Dual-Band Wi-Fi the Xiaomi Mi Note 2 lets you enjoy the fastest data speeds out there. So head out to the play store and download the latest games and applications in the blink of an eye. With its superior data connectivity, you will no longer experience any annoyances associated with a slow internet connection. Whether you like to play online games, stream FHD movies, or simply browse the web – with this Xiaomi phone you are guaranteed to enjoy an incredible fast and smooth internet connection. The Xiaomi Mi Note 2 comes with a 12 months warranty, brought to you by the leader in Android Phones as well as wholesale electronic gadgets..